For those of you that have been following this series you’ve no doubt begun your metabolic conditioning so now it’s time to add in some gymnastics. Don’t let that word scare you, gymnastics merely refers to exercises using only your bodyweight. . . If you would have told me 5 years ago that I would take up gymnastics at the age of 45 I would have laughed in your face. You’re talking to the girl that couldn’t master a cartwheel at the age of 6. And while I will most likely never be seen performing a series of back flips across a stage gymnastics as a training modality can develop extraordinary strength (especially upper body and trunk) with its reliance on the body’s own weight as the sole source of resistance. As important as the capacity of this modality is for strength development it is without a doubt the ultimate approach to improving coordination, balance, agility, accuracy and flexibility. It establishes functional capacity for body control and range of motion. While most people will not advance to the traditional competitive sport that we’ve all seen on TV they will gain much from performing basic body weight movements such as squats, lunges, pull ups, dips, push ups, handstands, handstand presses, jumps, kips, cartwheels, sit ups, back extensions, and holds. These skills are unrivaled in their benefit to the physique as evident in any competitive gymnast. 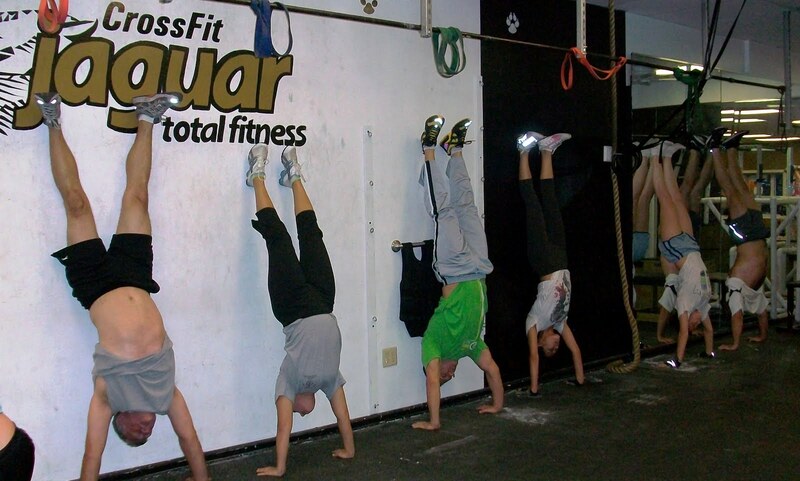 At CrossFit Jaguar we use bodyweight, short parallel bars, mats, still rings, pull-up and dip bars and a climbing rope to implement our gymnastics training. The starting place is with basic well-known callisthenic movements–pull-ups, push-ups, dips and rope climbs and form the core of your upper body strength work. For the novice we begin with modifications such as assistance with bands which reduces the amount of actual bodyweight used and we progress gradually in increments until full bodyweight can be used. Once the basic movements can be done for multiple reps we advance to the more challenging movements. To develop balance and accuracy one can begin to master the handstand starting against a wall if necessary–just like when you were a child Once reasonably comfortable with the inverted position practice kicking up to it against the wall and from there moving on to short parallel bars and eventually away from the wall. Walking on the hands is another excellent tool for developing both the handstand and balance and accuracy. This will ready you for handstand presses from the relatively easy ones that any beginner can perform to the difficult ones done by competitive gymnasts. The trunk flexion work is beyond anything you will see elsewhere for core development. The staples being the basic “L” hold. The “L” hold is nothing more than holding your trunk straight, supported by locked arms, hands on a bench, the floor or parallel bars and your hips at 90 degrees with legs straight held out in front of you. Beginners may bend the knees at 90 degrees as a modification. As for “stretching” or other flexibility work you want to stretch in a warm-up to establish safe and effective range of motion for the ensuing activity and stretch during cool down to improve flexibility. Start with the basic callisthenic movements; the more advanced movements will only come with great effort and most likely frustration. That’s OK–the return is unprecedented and the most frustrating elements are often the most beneficial long before you’ve developed even a modicum of competency. I still can’t do a cartwheel but during the 5 years I have been doing “gymnastics” I have made significant improvements at an age when most people’s strength and flexibility begin to decline. I put the ego in check, took a step back and the rewards have been far greater than any frustration in the process and transferred to other areas of my training. The only limitations one has are those that are self imposed. Next week, we hit the weights. . .